Library PARC is a high-density storage facility designed to house little- to no-use items owned by UBC Library. The facility also has a records management service for the UBC campus. Library PARC also has: an administrative area where books are cleaned, repaired, catalogued and digitized; a reading room for visitors wishing to view material stored in the facility; and one large climate-controlled storage module where books will be housed. In the future, up to five additional storage modules could be added based on need. What are the benefits of Library PARC? Low-circulation items from central Library collections will be relocated to Library PARC, freeing up physical space at branches for current, high-use collections as well as other uses — including student and research services, informal learning spaces, multimedia labs and spaces for scholarly exchange. Another important benefit is preservation: Library PARC’s carefully controlled environment will extend the life of collections up to seven times longer, ensuring their availability to future generations of students and scholars. Why does the Library need this new storage facility? In 2005, the Library launched the Automated Storage and Retrieval System (ASRS), its robotic storage facility in the Irving K. Barber Learning Centre. However, the ASRS is nearing capacity, so another storage facility is needed. High-density facilities such as Library PARC can be built and operated for about a quarter of the cost of conventional library space. Its modular plan means additional storage can be added at a lower cost if needed. At a time when print use is declining, the Library has an opportunity to free up space and resources by prudently managing its print monograph collections. Library PARC has the capacity to collect, digitize and disseminate research material digitally to serve a wider community, including other post-secondary institutions. 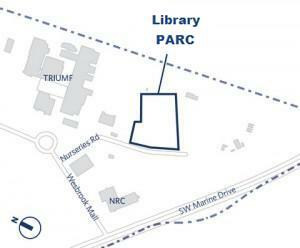 The PARC facility is located in the South Campus area at 6049 Nurseries Road near TRIUMF, UBC Farm and the National Research Centre. Who designed the building? Who constructed it? The building was designed by DGBK Architects. The construction company for the project was Wales McLelland Construction. How much did PARC cost? The budget for PARC, which is shared between the Library and UBC, was $10.5 million. The storage module is 2,280 square metres, and includes 10 metre (33 ft.) high shelves that can house approximately 1.6 million volumes. Final count of materials will depend on the types of materials to be stored. When did construction start and end? Construction began June 2014, and the construction company worked for several months to ensure a foundation that is able to support the weight of more than one million volumes. The building was officially opened in October 2015. What services will PARC provide? In addition to storing books, journals, maps, records and other print materials, PARC will provide a reading room for Library users, a courier service to ship requested books back to the main campus area, the option for digitized copies of borrowed materials (in some cases) and other digitization services. Additionally, Library PARC also houses a records management service for the UBC campus. Once books have gone to PARC, can I borrow them? In most cases, yes. Books stored in PARC are low- to no-use, but that doesn’t mean that you can’t borrow them. Items in Library PARC will be delivered to users via electronic scanning to desktops when possible and physical delivery to central campus as needed. They will also be accessible on-site. Do other university libraries have high-density storage facilities like PARC? Storage facilities of this kind were first established at Harvard in the 1980s and are a proven, economical means of housing research collections for the long term. About 40 such facilities currently exist at universities across North America. What collections will move to the new storage facility? Low-use, last-copy monographs, serials, series and unique archival holdings that have projected future low use. Texts that may reliably be found completely online (especially journals and indexes where electronic surrogate criteria are applicable). Runs of rarely used serials. Physical copies of digitized texts. Runs of older serials where there is a last-copy commitment, usually available online. Microfiche, microfilm and map collections that are designated for retention and not duplicated in another format. When will the collections move to Library PARC? Which collections will move first? The new facility began receiving collections in mid-2015. Some materials were prioritized for intake into the new facility. A temporary storage facility located in Surrey was the first collection to move. This collection was approximately 300,000 low-use items, including a large number of older serial holdings for which the Library has perpetual online access.